A summer rainstorm aided firefighters Saturday battling the West Fire, which is now 81 percent contained with 504 acres burned and some evacuation orders lifted, according to Cal Fire. Residents were allowed back into their homes in the Palo Verde Ranch and Rancho Palo Verde communities, and in other areas west of South Grade Road and the fire perimeter. All other evacuations remained in effect. Residents had initially been ordered to leave Alpine Oaks Estates and a large swath of territory bounded by Tavern Road, Alpine Boulevard, Viejas Creek Trail and Japatul Road. 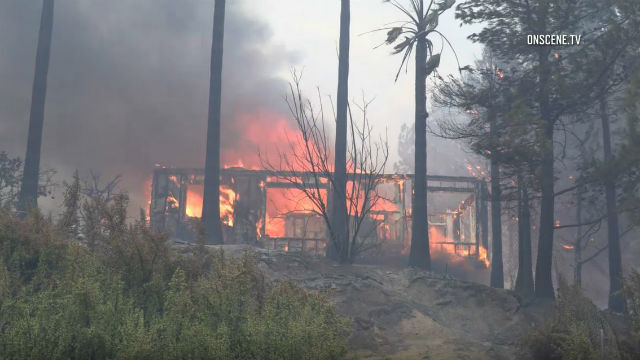 Calm winds and scattered rain from a thunderstorm created hope for firefighters continuing to battle the flames, which had destroyed 18 structures and damaged eight more as of Saturday morning. 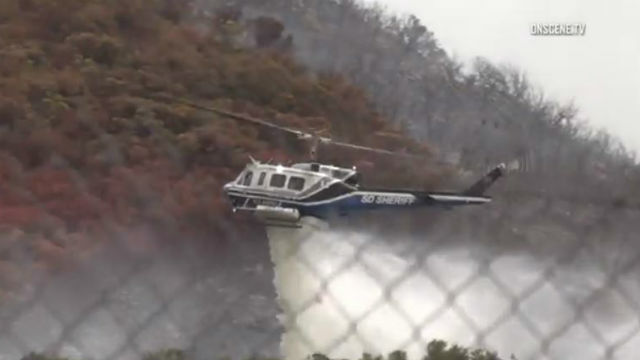 “It certainly can help,” Cal Fire Capt. Kendal Bortisser said. The blaze began about 11:15 a.m. Friday on the south side of Interstate 8, at West Willows Road, east of Alpine, according to Cleveland National Forest officials. The wind-stoked flames soon reached a “critical” rate of spread, CalFire reported. On Friday, television news helicopters showed large tile-roofed homes residential trailers and small outbuildings engulfed in fire. The American Red Cross set up an evacuation site at Los Coches Creek Middle School on Dunbar Lane, and a temporary shelter was established in a parking lot at Viejas Casino. The Lakeside Rodeo Grounds on Mapleview Street was providing room for livestock. Two of the three uphill, eastbound lanes on Interstate 8 were blocked for a time Friday afternoon, but were later reopened. One crew member suffered minor burn injuries to his face while battling the blaze, and had been expected to remain hospitalized overnight, CalFire reported. As of 7 p.m. Friday, the utility tweeted 1,100 customers in the Alpine area were without power. Power had been restored to most of those customers by Saturday afternoon, but about 160 customers remained without electricity. Gov. Jerry Brown declared a state of emergency for the area late Friday. The gubernatorial decree cleared the way for the state to provide immediate disaster assistance to the county, allows for expedited unemployment benefits for anyone who lost a job due to the blaze and waives fees for replacement of documents — including birth certificates, marriage licenses and vehicle titles — lost to the flames.